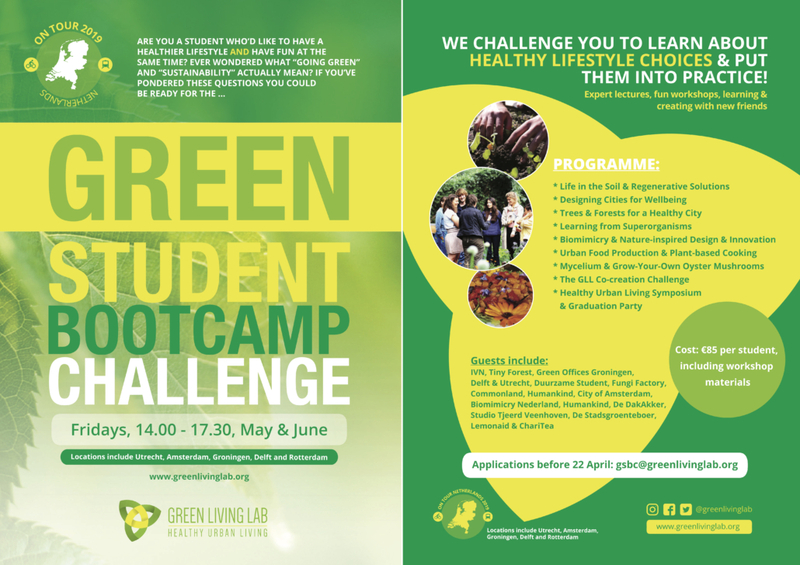 This year’s Green Student Bootcamp Challenge is going nationwide, as participants set off on an inspirational tour of the Netherlands in May and June. This is the 4th year of our experiential learning programme for higher education students in the Netherlands. We are both delighted and proud that our graduates from previous years are helping to organise this year’s programme and will lead some of our workshops! On Friday afternoons, 14.00 – 17.30, in May and June, sessions will take place at diverse locations in the Netherlands in partnership with educational organisations, experts, entrepreneurs and innovators all working to create solutions for a healthier and greener world. The Bootcamp Challenge brings students from diverse universities in the Netherlands together for one semester to learn how to make healthy lifestyle choices in balance with the natural world. Our immersive green learning experience takes a holistic approach to student health and wellbeing, as students are encouraged to relax in nature, feel connected to the natural world by acquiring both knowledge and experience, and reignite the joy and wonder of the natural world that we all shared when children. Just as in nature, we see that increased diversity in the group of participants leads to a richer learning experience for the group as a whole. We invite students from all study backgrounds to take part, and no prior knowledge of the course content required. Students learn from experts, entrepreneurs and each other as debate and sharing knowledge and experience is actively encouraged throughout. We introduce students to diverse themes with a focus on exploring the links between our health and wellbeing, with that of our environment and our world. Students are given weekly challenges to be completed at home or as a group, and based on knowledge from previous sessions. In this way, students are asked to apply knowledge in a practical sense immediately. Students share their learning experiences in an online forum, so they also can learn directly from each other. This year sessions will take place in Groningen, Delft, Rotterdam, Utrecht, and Amsterdam, where we will welcome new partners and meet some amazing partners from previous programmes. We’ll learn about the interconnectivity in nature from IVN , Tiny Forest and Fungi Factory, hear from De Stadsgroenteboer about the role of CSAs in urban food production and how to cook healthy plant-based meals, learn of innovative solutions inspired by nature from Biomimicry Nederland and TU Delft, about trees and their role in a healthy city from City of Amsterdam ecologists, and visualise the healthy city of the future with tactical urban planning experts Hannah Wright and Humankind. Other partners include Green Office Groningen, Green Office Utrecht, Green Office Delft, De DakAkker, Studio Tjeerd van Veenhoven, Commonland, and Duurzame Student. A big thank you to LemonAid and ChariTea for sponsoring the programme! http://greenlivinglab.org/wp-content/uploads/2019/03/Front-flyer-2019.jpg 4173 2952 GLL http://greenlivinglab.org/wp-content/uploads/2016/02/logo_340-01-01.png GLL2019-03-27 23:11:392019-04-13 13:49:20An Inspirational Green Tour of the Netherlands!